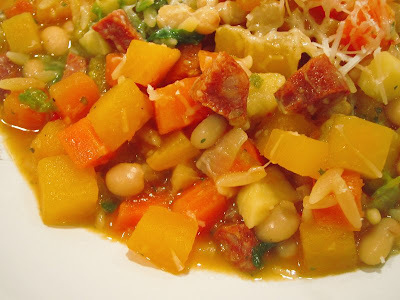 If there was ever a hearty, nutritious bowl of soup it has got to be minestrone. Different regions have their way of doing it - in Genoa they add a great big spoon of pesto to serve, Naples and Milan have long lists of ingredients whilst the historically poorer areas such as Puglia have a more modest but equally delicious recipe, some use pasta, some rice and some are just vegetable based. In a large sauce pan, heat a good slug of oil and add the chorizo sausage and onion until the fat releases from the sausage and the onion has softened. Add and sauté all of the cubed root vegetables and potatoes for a few minutes, stirring regularly to prevent sticking. I always add a couple of small potatoes that I cut finer as they will disintegrate and thicken the soup. Add enough stock or just water to almost cover the vegetables but not completely. Add a couple of tablespoons of tomato puree or a few chopped tomatoes. If I have the rind end of a Parmesan left from grating I chuck this in whole and remove it at the end. It releases a superb flavour and a great use for it other that the dustbin. I just save them up and store them in the fridge (yeah, I eat a lot of Parmesan). Add salt, pepper a nice bit of chili for a kick and some chopped parsley, thyme and/or oregano. If you have a bayleaf or two pop this in now. Let this all boil happily then simmer for half an hour, stirring occasionally until the soup has thickened. Add the beans or peas and a handful of small pasta shapes or rice and then the shredded greens. Continue to simmer until the pasta and rice are ready. Fish out the rind and serve up with a load of freshly grated Parmesan and maybe a drizzle of olive oil if you like. This will make enough for 4 generous servings and is even better heated up for another meal later.